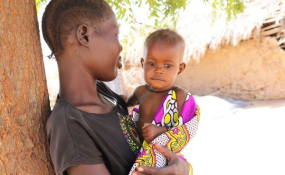 Lydia Ekeno with her seven-month old baby girl, who was diagnosed with severe acute malnutrition in January 2019. Mombasa — No one has died owing to the drought in various parts of Kenya, Deputy President William Ruto said on Wednesday. Ruto termed the reports of deaths reported in parts of Turkana and Baringo county as "fake." "Concerning the drought and food situation in the country, there is a lot of fake news around what is happening. For example, we were told 11 people have died... that is not true," said Ruto in Mombasa. "The area chief and the other fellow who gave the report on fake deaths has been taken in because this is a serious matter that we cannot take lightly," said Ruto. "It is true as a nation, we know where we are. Only 16 per cent of Kenya is arable and 86 per cent is arid and semi-arid, which generally means we are a water-stressed country," said Ruto. "We do not have food-deficiency in the country, the challenge has been distribution. Nobody has died, and we are working round the clock to ensure that no one dies," he said.